Roy's eye twitched, glad Mino wasn't in the room as she slowly got out of the bed. "I'm killing him..." She paused, breathing in a bit, "Sasuke!" She shouted, making her way towards the door. Minoushje was standing in the hallway when Roy walked out. "Where do you think you're going?" She asked, her arms crossed in front of her chest. Roy glanced at Mino, her eyes narrowed. "Following an idiot. He's going to do something stupid...and I'm not going to be the reason he does it." She said, clenching her fists. The second Sasuke saw Mino enter Roy's room he took the opprotunity and left the building heading off to the Akatsuki base at the speed of light. "You can't stop him anyway, Roy." Minoushje said as she guided Roy back to her bed. "You can barely walk, let alone run after someone as fast as Sasuke-kun." Roy sat down reluctantly and glared at the door. "He's going to get himself killed...and then what the hell do I do?" She said, looking to Mino. 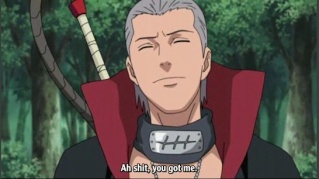 "He's going after Hidan...There's no way he's going to come out of the fight without having fatal wounds." Her gaze fell to the sheets as she gripped them. "I just wanted him to stay here with me..."
"Want me to go after him?" Minoushje asked. "I might not be the right person to stand in front of Hidan, seing as he knows be biggest weakness, but at least I can look out for Sasuke a bit." Roy narrowed her eyes, looking out the window. "It'd make me feel better knowing someone went with him...but I'm not putting you in that situation. Just...I'll write a letter to Sasori-Sama...I'll get him to watch out for Sasuke." She said, reaching over to grab a nearby pen and paper. "DEAR OPRAH." She said, writing: 'Danna~'. Minoushje grinned after which she walked to the window, letting out a high whistle. A few moments later Cat landed on the windowsill. "Cat will bring the letter, she knows where the Akatsuki base is. Meanwhile I'll make some tea that'll ease your pain a bit." Roy sighed, smiling a bit. I have a huge favor to ask of you~. Sasuke should be barging into the Akatsuki base here pretty soon because of what Hidan did...I just need you to watch Sasuke and make sure he doesn't do anything stupid that might end in him getting hurt. I'd really appreciate it. Folding up the letter, she handed it to Mino. "I hope Sasuke doesn't do something foolish. Like break down the door and yell." Minoushje walked to the window and tied to letter to Cat's paw. "You know where to go." She said after which the bird flew away. Next she turned back to Roy. "I don't know how but for some reason she knows where the Akatsuki base is... I just don't know if she can recognize Sasori's chakra after she sensed it only once."